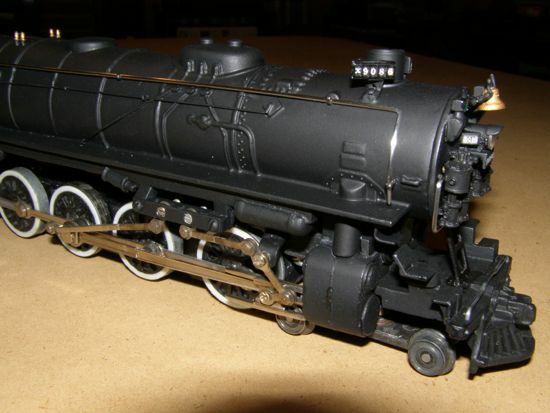 A few years ago I started thinking about the possibility of making a really long locomotive. 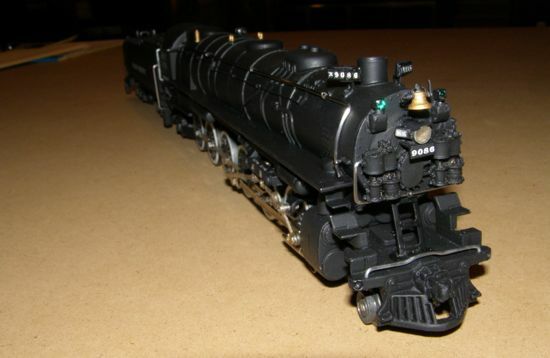 The Union Pacific's 4-12-2 (Union Pacific type) came to mind. It was the longest rigid wheelbase steam locomotive put into production. 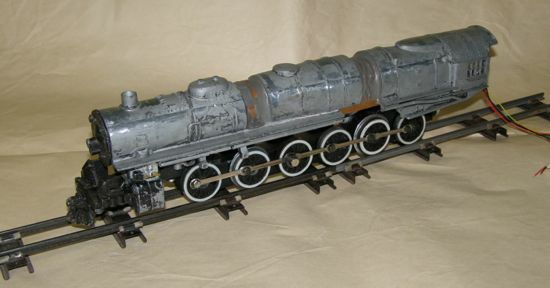 There were other locomotives similar to this (including some with 14-wheel frames) made but they were one-of-a-kind samples that were not very successful. 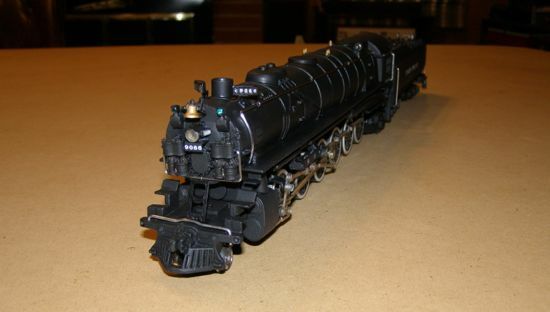 The Union Pacific made more than 50 of their 4-12-2 design. It was designed to pull 125-car trains at speeds up to 50 mph. My first step was to put the frame together just to see if it could be done and if it would work on a layout. The first pictures show the frame being assembled. I used two six-wheel frames and one four-wheel frame. There is a larger space between the first and second sets of drivers than the others and the four-wheel frame provided this spacing. After putting the frame together (with drivers) I tested it using a standard Gilbert motor and a temporary tender frame. It actually worked and could negotiate 54-inch curves (it could get around standard Gilbert curves but reluctantly). After that testing phase I installed a can motor and LED headlight. Next I used a Gilbert Northern boiler that I cut (very reluctantly) and lengthened to fit on the frame. These pictures show the pieces and the length of copper pipe I used to strengthen it laid out showing how the boiler was cut and how the pieces would fit together. Then I joined the pieces together using JB Weld. Once the boiler was in one piece I test fitted it on the frame and figured out where the boiler mounting points needed to be positioned. The boiler needed some detail work, including re-creating the after sand pipes (which were removed by one of the cuts), steam pressure relief valves, reposition the whistle, add air reservoir tanks, lower the rear ends of the firebox sides, install number boards beside the smokestack, and steps under the front ends of the running boards. There is also a long linkage rod assembly installed on the right side of the boiler to model the throttle linkage on the real locomotives. The boiler front needed extensive work. The cast-on headlight had to be moved up from its center position and was replaced with a brass casting. The cast-on bell bracket was replaced with a brass casting. 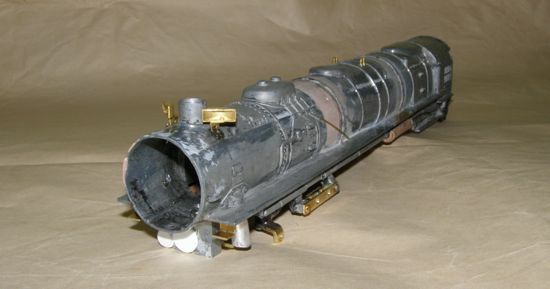 Two cast brass air pumps were installed on the boiler front and a small smokebox door fashioned and installed. Also, a U-shaped handrail was installed and two marker lights (Gilbert type) added. A ladder to the smokebox door was installed on the pilot. The tender was made from a Gilbert Northern tender with no major modifications. Just a paint job, lettering and coal. An electronic reverse unit was installed in the tender along with two switches, one to lock the reverse unit in forward if desired and one to turn off the smoke unit. A pair of American Models six-wheel tender trucks was used for this model. The finished model was assembled on Monday February 10, 2014. That same night it was taken to Jeff's S gauge layout for a test run. It performed satisfactorily with some minor running-in problems but after a few minutes it was running very nicely.